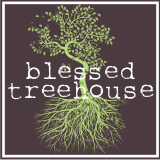 Blessed Treehouse: Feeding the cats who live under the shed. Chores have never looked so splendid. um...my favorite part is henry's monkey pants...and monkey jacket! love it! !